Phillips Volkswagen never had a dedicated website before. For years they struggled on with a website supplied by VW which did not give them full control and they had no say in what the website looked like or the features and offers displayed. 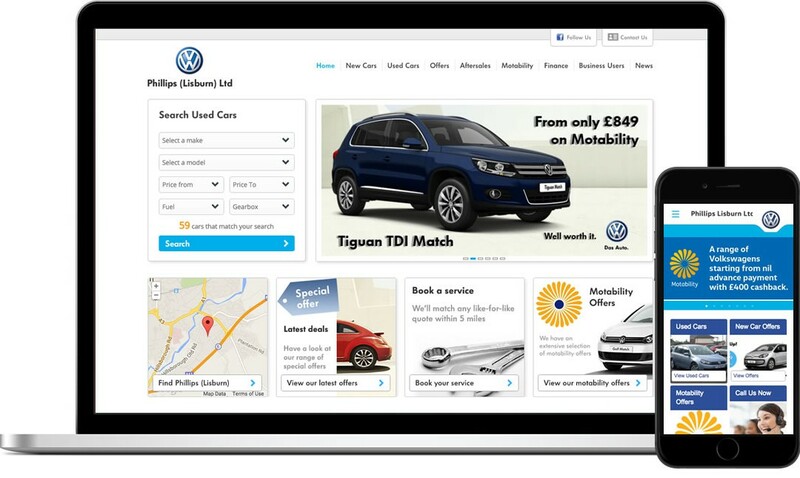 Their new website gives them a massive range of tools for uploading offers, used cars and feeding them to 3rd party advertising websites. “BlueCubes had been recommended to us when we decided to arrange a website. Stephen, the MD, called with us to explain how to go about getting a site set up and discuss options for the look and content as well as trying to maximise our presence on the web. He guided us through every step from initial thoughts to the finished product. His designers worked with us to fine tune our content, answering all the questions we threw at them (and there were plenty!) and making tweaks to the site as we went along. The prices were competitive and very good value for the amount of work involved and for the quality of the finished site.